Heat oil or butter in a large soup pot. Add carrot, celery and garlic and sauté until carrots begin to soften (but aren’t completely soft). Add butternut squash and thyme. Stir to combine with other vegetables. Add broth, salt and pepper and stir. 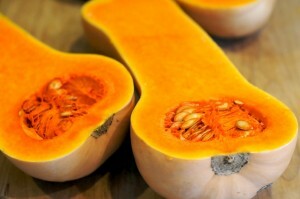 Bring to a boil, reduce heat and simmer until squash is tender, about 30 minutes. Use an immersion blender to puree soup or allow to cool slightly and carefully puree in batches in a traditional blender. Serve as is or with garnishes below. Add Apple & Bacon: Either add 1-2 cubed apples when you put in the butternut squash and blend it in, or add cubed apples during the last 15 minutes of cook time. Garnish with chopped, cooked bacon. Add a tablespoon of chili powder, a teaspoon of cumin, and a dash of cayenne to the soup. Garnish with toasted pumpkin seeds, cilantro, green onions, sour cream, and hot sauce. Stir a tablespoon of red curry paste and 2 teaspoons chopped fresh ginger into carrot, celery and onion mixture. Cook until vegetables are tender and ginger is aromatic. Add squash, cook until tender, then add 3 cups of broth and 1 can of coconut milk. Season with salt and pepper. Puree soup as above and then garnish each chopped fresh cilantro and green onion.